Editor Alex Segura gives a candid view of Archie Comics‘ latest venture beyond Riverdale. So whenever they’ve been revived in recent years, I’ve always given them a shot. And when I heard that the company was doubling down on the line after the success of Dean Haspiel and Mark Waid’s The Fox under the Red Circle imprint, as well as adult-skewing titles like Afterlife With Archie, I wanted to get the inside hubbub on the newly rechristened Dark Circle Comics. Who best to talk to than Alex Segura, Archie’s PR maven and, more importantly in this case, editor of the line? 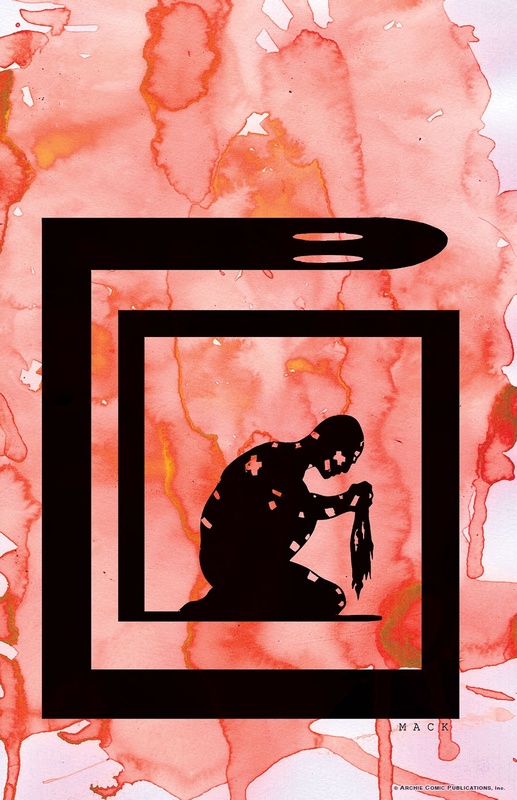 Dan Greenfield: What’s the Secret Origin of the Dark Circle imprint? Alex Segura: Great question. It goes back to when I first returned to Archie, tasked with editing the superhero titles. I knew we wanted to do something different — something closer in tone to a cable network as opposed to a traditional superhero universe. Something that let the creators drive the bus as much as they could in an existing, company environment. I — along with the great editorial team I’m working with that includes Editor Paul Kaminski — was chugging along with that mandate in my head, but our Publisher/Co-CEO Jon Goldwater suggested we rebrand the imprint. I was reticent at first, because I’m an if-it-ain’t-broke-don’t-fix-it type, but the reality is, we needed to break away from the past and establish this interpretation of these characters as its own thing. Thus, Dark Circle Comics was born. What message are you trying to send to readers by changing the name from the brighter Red Circle? Just how dark are these books going to go? I think people might be taking the “Dark” part of the name a bit too literally, which is understandable. The name change is about being different from the past. And also about opening the door to new versions of these heroes and unshackling creators when it comes to getting their hands dirty in terms of how to play with these toys, or new toys, because we want to introduce new concepts here as well. I think from looking over the first wave of titles, it’s clear we’re not just doing “dark” books. Black Hood is definitely going to be a dark, crime/noir title. Which is perfectly in my wheelhouse as a writer and a fan. But then you have something unabashedly wacky and off-the-wall like The Fox, which is very much a Dark Circle book but not “dark” in the traditional sense. It’s superheroes on acid, basically. Or The Shield, which veers more toward a traditional superhero action romp, but with a coating of espionage and secret history that’s perfect for today’s reader in a world of NSA surveillance and globalization. So, there’s a lot going on that covers a wide array of genres, tones and themes, which is exactly what we want. Beyond The Fox, which was already established, how did you come to decide just which of the characters to start with? Why not, say, the Web, the Fly, etc.? Though not completely clear at first glance, all these books happen in the same universe. So, we wanted to build from the outside in, if that makes sense. I think the misstep we took with New Crusaders, which was a great, fun and entertaining book, was that we threw the reader in and asked them to process and digest not only a dozen new characters but their Golden and Silver Age histories and how they created the modern versions. It might have been a bit of overload. 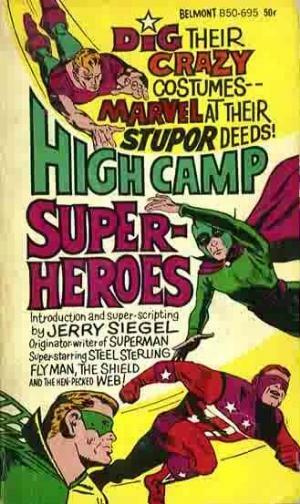 We’re going to build each of these books as their own things, with maybe an occasional nod to what’s going on elsewhere, in the classic Marvel ’60s way — “Oh, look, there’s Spider-Man swinging by!” or a Latveria mention. But, by and large, these books will happen on their own and slowly build toward a greater whole. Whether that’s a Crusaders book or what, remains to be seen. So, when deciding which characters to use, we were looking for characters that were different from one another and we came up with a crime book, an action book and the return of a psychedelic hero quest book. They’re all clearly different and can live on their own but also overlap a tad as we build this universe and respect what’s come before. 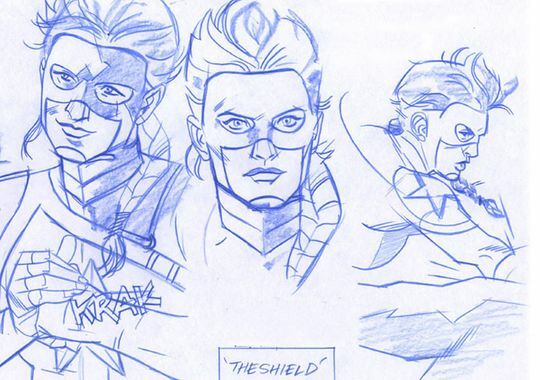 For The Shield, you went with two non-comics writers. That’s kind of a risk because those talents don’t always translate. What have been some of the challenges on that front? And what have been some of the surprises? With The Shield and Black Hood and to a degree The Fox we went with creators that didn’t really inhabit the comic book mainstream. Because that’s not what we want. Marvel and DC can tell multi-part epics involving a thousand characters really well. But we want creator-driven drama that focuses on unique and compelling characters that maybe don’t fall into those pre-set molds. 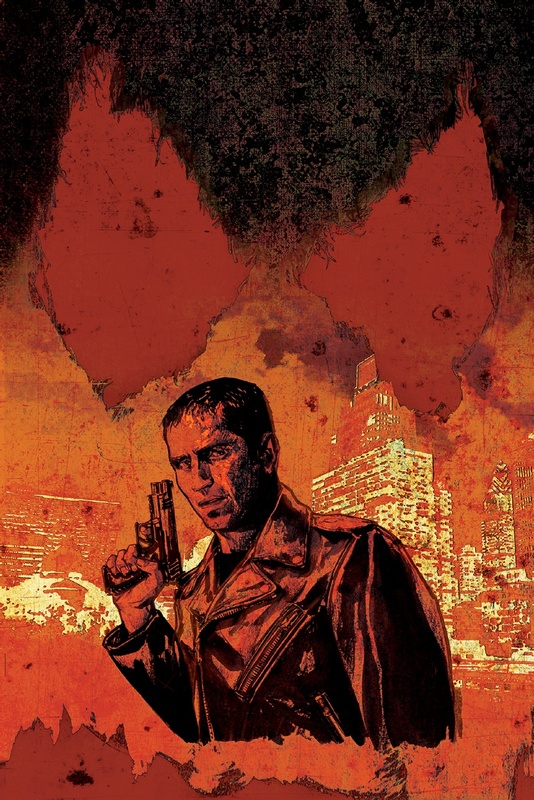 We wanted a more cinematic and novelistic approach, so it made sense to reach out to people who maybe have some comic book experience — like Duane Swierczynski — but are also known for their work elsewhere. Duane, Adam Christopher and Chuck Wendig are bestselling, acclaimed novelists. I wanted that outside-the-box thinking to be a part of Dark Circle. I didn’t want these books to read like anything else because then what’s the point? And Dean Haspiel is a complete outsider, even when he’s drawing Batman or the FF. He brings his own voice and style to everything he does, which is what Dark Circle is all about. I can’t really point to a specific hiccup with Adam or Chuck because they’re such pros — they turn stuff in on time, they’re kind and receptive and they know when to push and when to fold. I think that back and forth, between creator and editor, is really important. You have to know how to read the other side. So far, they’ve been a pleasure to work with, and they bring in a level of care and enthusiasm I wasn’t expecting. Maybe it’s me, but I noticed that the Shield is not built like your typically wasp-waisted, top-heavy comic-book superheroine. Rather, her hips are wider, her shoulders are broad and she seems to have a reasonably proportioned chest. Is this intentional? If so, I think that’s great. It is intentional, yes. We want the characters to look like real people. The Shield looks like a fit and active woman. 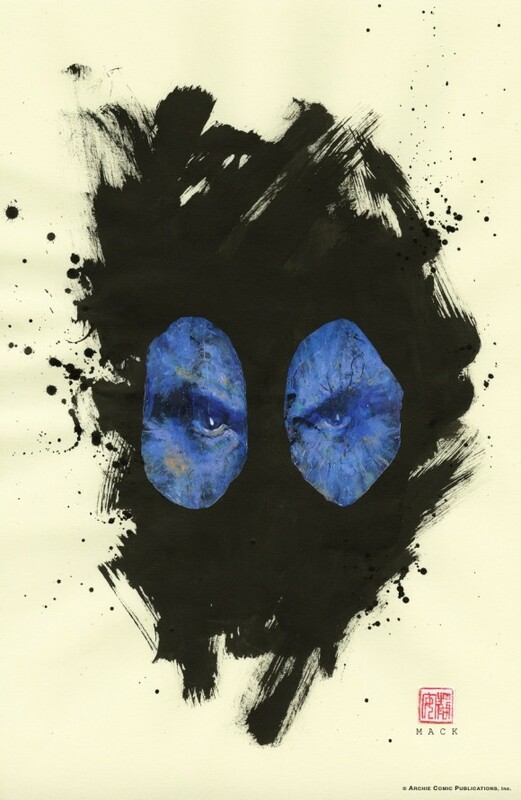 The Black Hood looks like a dude who has been through a few rounds. He’s not a pretty guy. 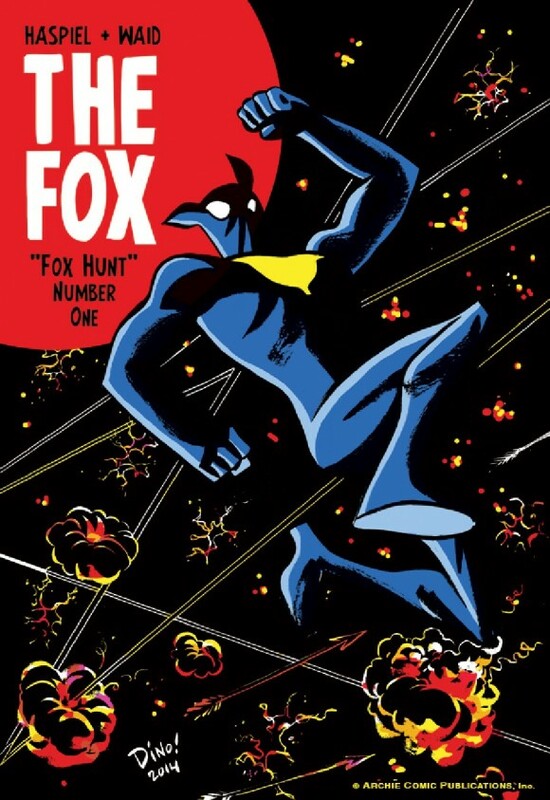 And The Fox looks like someone Dean Haspiel would draw — emotive, human and flawed. Artist Wilfredo Torres did a great job designing not only the new uniform, but the look of the new Shield. She has personality and you can feel it just by looking over the rough character designs we debuted and the final full body shot. She has a smirk on her face. She’s tough, smart, independent and you will be sorry if you cross her. I love the character. I think fans will be pleasantly surprised. Personally and professionally, you know that I’m a Batman fanatic. 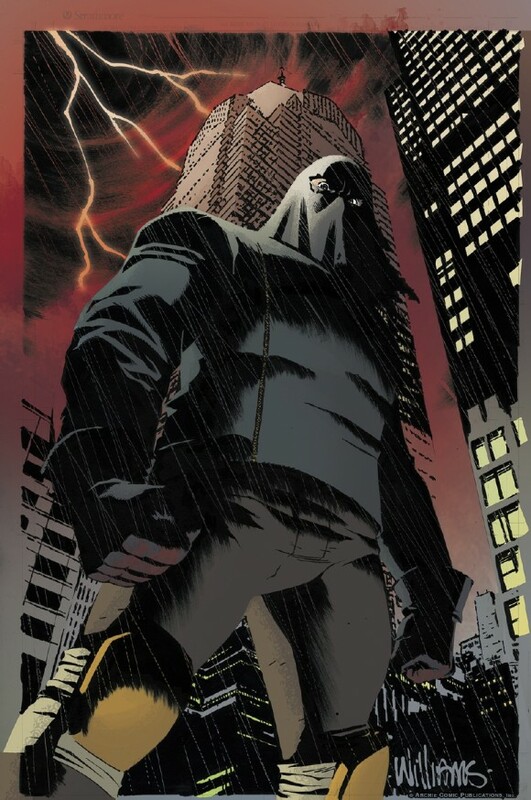 So naturally, I’m going to be drawn to a character like the Black Hood. But comicdom is rife with dark avengers of the night. What makes this one different? I love Batman. I love Moon Knight. I love Daredevil. We’ve talked about Batman a lot. We’re both students of the character. When we knew Black Hood was going to be the first out of the gate, we knew he had to be different. So it became less about creating a dark avenger and more about creating a compelling story about a flawed character who happens to put on a hood and fight crime. It’s closer to shows like Fargo or Boardwalk Empire and The Sopranos. It’s a crime comic. It’s not about having a rogues gallery or getting a sidekick. You won’t see many superhero tropes in this book, and it won’t look like a superhero comic thanks to the art by Michael Gaydos and stunning David Mack cover. It’s going to read like a great HBO or FX show in comic form. You’ve worked for DC. You’re a novelist. This is your second run at Archie. Given your experiences, just how nerve-wracking is it to launch a line that is kinda-sorta-partially from scratch — especially in such a crowded field? Man, it was a new kind of anxiety I’d never felt before. Usually, I’m the PR guy collecting the information from editorial and deciding how to announce it. Now, I was the editor getting the details together for the PR guy to announce and basically having conversations with myself. I’m exaggerating slightly. But yeah, there was a lot of impatience in advance of the news breaking because you’re working in a silo, basically, and then you’re left to finally lift the curtain and hope everyone likes it. Luckily, we have a great group of people in the Archie offices to bounce ideas off, including Jon, CCO Roberto Aguirre-Sacasa, President Mike Pellerito and Paul. I know if these guys dig it, it’s gonna be good. I trust their taste. And, a dear friend who’s also an editor at a major publisher took me aside in San Diego and confirmed my philosophy for me. She said “Trust your taste.” And that’s what I’ve been doing. I have to hope that if I would excitedly read these books each month, the books will find an audience. If not, hey — I got to make comics for a while. Without spoiling anything — and without saying “Oh, it’s all exciting” — what’s the most exciting, single thing you’ve seen from the creators so far? The opening scene to The Shield #1 will blow people away. You’ll know, right there, why she’s the star of the book. If fans thought Freak Magnet was a unique, crazy ride, it’s going to look like It’s A Small World compared to the Space Mountain that is Fox Hunt. After reading over Duane’s pitch and sending it to Gaydos, I thought he’d take a few days to digest, but a few hours later we had some character designs that flew around the office — everyone was stoked. These guys together are going to make something very special, I think. Dark Circle will launch in 2015. Excited for this. Archie in the past has had some good takes on these characters. If anything, it’s more amazing that they haven’t steadily continued and changed with the time. One thing I’m interested in finding out is if these titles will carry traditional Archie newsstand distribution. If they will, I think that’s a great thing, as DC, Marvel and the rest largely are not on newsstands any more. Not as thrilled with The Shield, but definitely Black Hood and the Fox are going to get my money. Looking forward to the Fly and the Hangman later. What price point will these be at ? $ 2.99 would guarantee more eyes on it as well.